Sooooo Wonkey's twitter just mentioned a player in Japanese arcades witnessed a bug allowing you to play Devil Jin, Kazumi, some female that looks like Jaycee and....Yoshi!!!!! I read the 2ch post Wonkey sourced too and the guy said he didn't get to take a picture but Yoshi somewhat resemebles King Gainer from Overman King Gainer. Hey guys, I've been thinking about making teaching content for aimed for total beginners at tekken and fighting games in general. I've had my little succes with sharing little fgc on upon a few. One of things I've come to realize, which this little experinence it that how much it's fondamently changes a persons perspective upon the game when you have an actually strategi going on instead just hoping for the best when you press bottons. You can rarely play these kind of games intuitively because lot's of the stuff in games are very unnatural for people that's not adapted to fighting games. That makes it hard to from at proper game plan, based on dumb things you have got "succes" with. Even too this day I've still play King like retard, and I would say that my Kazuya is much better by now than King, despite being the first character i've ever touched in Tekken! I think that's an awesome idea, the community needs more people that are willing to show people the most basic things and help them to learn! It will be very difficult but a very noble task. If you could bring even a few new players to Tekken, you would be accomplishing something that even game developers are struggling to do! I say go for it and see what you can do! I was reading through the chat thread, and when I came across this, I couldn't help smiling. . . Although I feel very sad with a personal situation going on, that makes me feel helpless; I couldn't help smiling cos this sounds just like something my brothers would do. They've actually drawn Yoshi-san for me purely as a surprise gift-art, when I've gone through bad spots in life before. Very sweet. Alright I'm trying to play solo yoshi online for awhile now seeing how it goes. So far it's pretty nice, I feel that I can be pretty creative while only focusing on one character at the time, because sometimes I'll even do some moves in a panic situation that yoshi doesn't have like a basic down jab.... I really need adjustment time for being well and prepared for another play style. People rarely don't know yoshi that well, so when you play against others I'm mostly getting pressure with b+1,1. u/f3+4, u+3+4. d+2,2,d+1 mix it up with a different timing and rainbow drop and door knocker. Indian stance is the best tool for checking the mentalty of your opponent. Do it (Shia labeouf) from middle to long range and begin to stall with teleportning back and do 3 when your opponent is starting to run (people will do so even with full health!). Sounds pretty cool, Glenn! ^.^ Of course it all goes over my head, but I love watching my brothers play Tekken on-line. I was able to have fun with this today, I normally just pratice lot's of movement and stuff, because I'm much more of a glass cannon with my tekken mood than I like to be, I know that inner enjoyment scale can tip any second, and turn it into a sense of failure, rather than rewarding thing to do since. I'm finally able to raise in rank again and despite my fears of lacking abillites for adaptation. It turns out that online players aren't really that flexible either kinda makes sense actually but that's still excuse for me.. I can concur that Yoshi isn't a strong solo character. He doesn't deal a lot of damage by himself and it's hard to maintain the mix-up pressure when your opponent gets a chance to switch characters. He has many options as a partner though so it's much better to take advantage of that rather than going solo. Good to hear you're having fun playing online. I've stopped playing online for a few months now and I've only been playing offline with friends now and then. I recently gotten a PS4 and am currently mostly playing Dragon Quest Heroes. I've mostly been watching Tekken 7 vids than playing nowadays but I've been following Tekken news closely as always. Yeah I have failed I was too much uncomfortable with both arcade sticks which had hori parts instead of sanwa parts and with PS4 gamepad. Too bad I didn't know that I can play on a gamepad, I would bring my own (fighting commander pro). Btw how did the game feel. I know it's on a different controller and stuff, but I can remember how much of a change the tekken ps2 era to ps3 was in terms of general feel, was it compairable to that? Mastering backdash cancel will be more important in this game... my backdash is so-so, not perfect. Yes indeed, being a competitive player I can say that it takes a lot of energy... it's like sport, you have to train constantly to be in good shape. I find it hard to keep it up with all the opportunities around me, constant urge to level up my web development skills, and many projects that I have to maintain. And... great fan fiction Aozame! I've read it with much pleasure I dropped you a little comment on the page. More, more, MOAR! 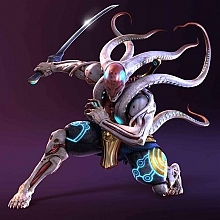 Anyway, I got nothing, unless the "real life Yoshimitsu" around town counts. *laughs* No, seriously, I've had other things on my mind lately. . . Seems like bad news every other day, and I'm stressed thanks to the holidays.